I usually spend every other Saturday in my hometown, working as a butcher in my Dad and Uncle’s grocery store. Last time I was there, during an afternoon lull, I noticed a calibration verification sticker on the scale used to weigh meat (not unlike the verification stickers found on gas pumps). Accurate calibration of the meat scale is required to ensure that the customer gets what they are paying for, and to ensure my Dad and Uncle are making a reasonable profit on goods being sold. I’ve never been around to witness the USDA inspector verify the calibration of the scale, but I can imagine he or she carries a small set of reference weights that are placed on the scale to determine the scale accuracy and need for recalibration. Customers often contact Apogee Instruments to inquire about how often pyranometers and quantum sensors should be recalibrated. While it is safe practice to follow the general recommendation to recalibrate radiation sensors every two years, it may not be necessary to recalibrate on a fixed schedule if a sensor consistently matches a reference. The challenge for many pyranometer and quantum sensor users is they don’t have a handy reference, something analogous to weights that can be placed on a meat scale. 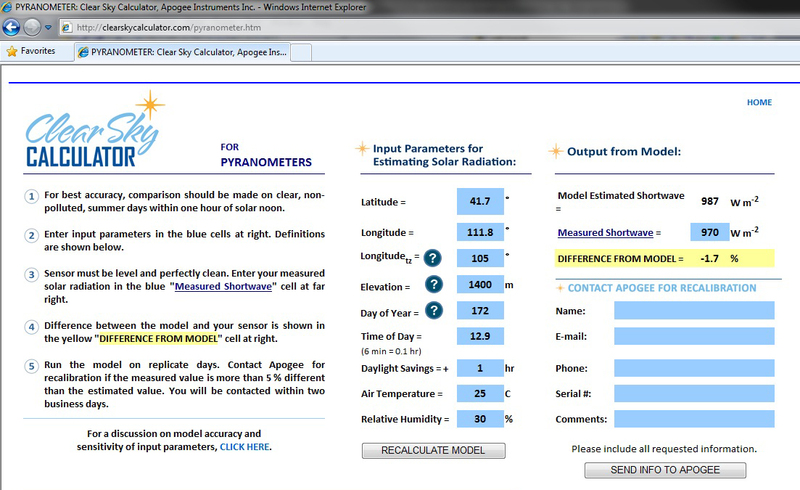 In response to customer inquiries regarding recalibration requirements, in 2009 Apogee Instruments developed the Clear Sky Calculator (www.clearskycalculator.com), an online tool that can be used to estimate the intensity of solar radiation (either total global shortwave radiation, measured by pyranometers, or global photosynthetic photon flux density, measured by quantum sensors) incident on a horizontal surface at any time of the day, at any location in the world. 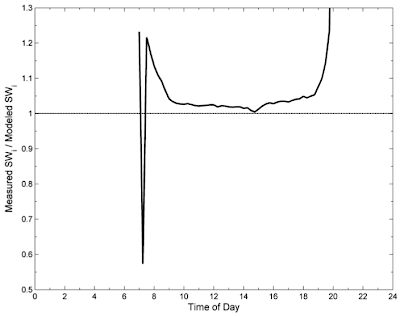 The equations used to estimate clear sky solar radiation with the Clear Sky Calculator come from the clear sky solar radiation model used to calculate net radiation in the ASCE Standardized Reference Evapotranspiration Equation (http://www.kimberly.uidaho.edu/water/asceewri/index.html). The only input requirements to the calculator are site elevation, latitude, longitude, reference longitude, and air temperature and relative humidity measurements or estimates. 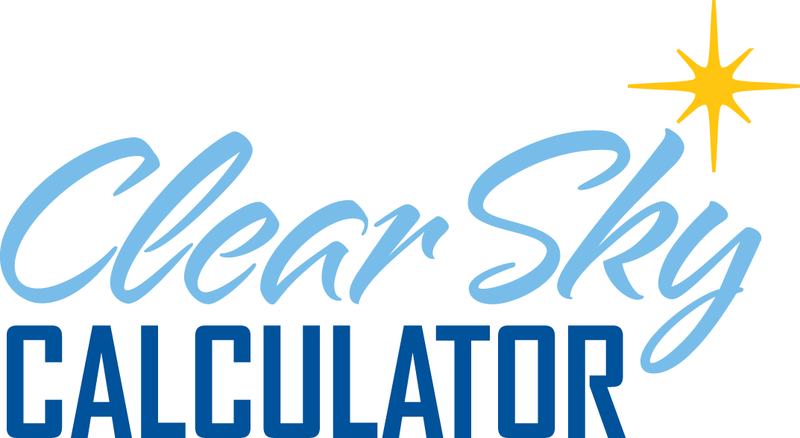 These data are typically easy to obtain, making the Clear Sky Calculator a simple solar radiation reference that can be used to estimate pyranometer and quantum sensor accuracy and determine the need for recalibration. When used near solar noon over multiple clear, unpolluted days during spring and summer months, accuracy of the Clear Sky Calculator is estimated to be ± 4 % in all climates and locations around the world. 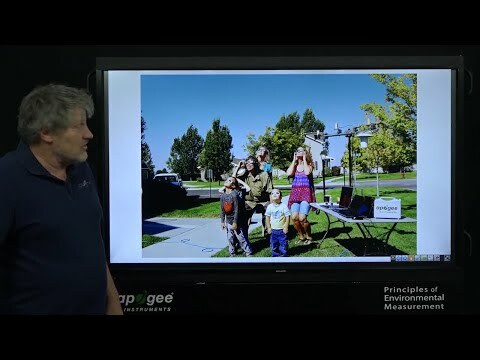 As an example, modeled incoming shortwave radiation (SWi) from the Clear Sky Calculator closely tracked measured SWi (data from a heated and ventilated Kipp & Zonen CM21 pyranometer) for a clear day (April 21, 2012) in Logan, Utah (Figure 1). 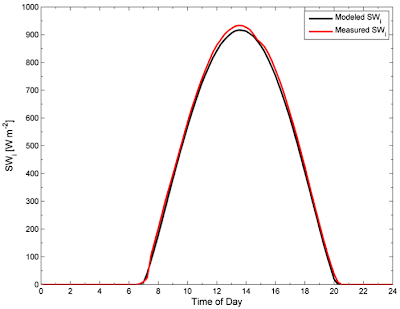 The ratio of measured SWi to modeled SWi was between 1.00 and 1.05 (0 % and 5 %) from 9 AM to 6 PM (solar zenith angles less than 65°) (Figure 2). 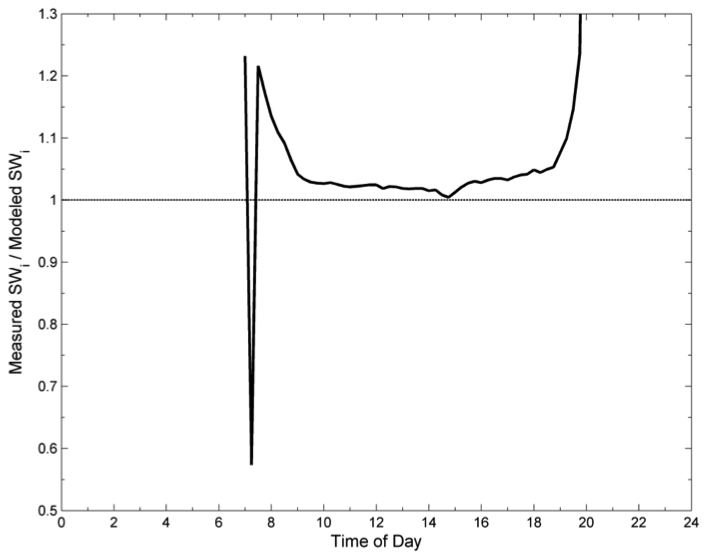 The average ratio from two hours before solar noon to two hours after solar noon was 1.02 ± 0.01 (2 ± 1 %). 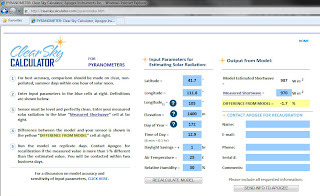 A more detailed discussion of Clear Sky Calculator accuracy is given on the webpage (http://clearskycalculator.com/model_accuracy.htm), where the necessary accuracy of the required inputs is discussed. Figure 2: Ratio of measured shortwave radiation (SWi) to modeled SWi over the course of a clear day (April 21, 2012) in Logan, Utah. Mean ratio = 1.02 ± 0.01 (2 ± 1 %) for measurements averaged from two hours before solar noon to two hours after solar noon (solar noon occurred at approximately 13.5). The dip in the morning near 7 is due to mountains on the east side of the valley where Logan is located. You can use a compass to calculate the direction of the roof or area you would like the panels installed on to. Alternatively you could use google earth or if you are not sure enter south.